It was fifty years ago today- September 21, 1968 the televison police procedural drama Adam -12 premiered on NBC. 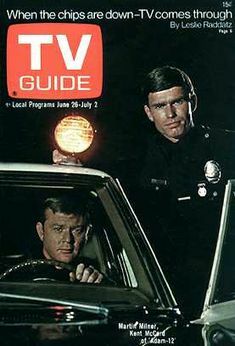 The show starring Martin Milner as the veteran police officer Pete Malloy and the rookie police officer Jim Reed played by Kent McCord was set in Los Angeles. The series was created by Robert Cinader and Jack Webb of Dragnet fame. My memories of this show- and I watched it often- were of being at my friend David’s house as a kid watching it. The show ran 7 seasons and 174 episodes. Love this show that I rediscovered a few years ago. More mature themes than I originally thought. Now here’s a show I remember. Probably more towards the later seasons but I remember really enjoying this show as a kid. “Adam 12 Adam 12, 311 in progress”!! WOW- you must have enjoyed the show. I can’t make that claim- but I have ordered season 1 from the library system. It will probably seem awfully old and outdated, but back then I sure liked it. I haven’t seen it in reruns. I caught this show in reruns and it really did a good job showing how Reed progressed from inexperienced rookie to an experienced vet. Molloy eventually even let him drive once or twice!